I have been on a semi-successful mission to narrow down my wardrobe lately. Part of the process is taking items from the back of the closet to the front and seeing if I reach for them. I've owned this dress for several YEARS now but still find its classic shape and bright color too good to give up on. I love how the dress looks (see here) but find that layering it works just as well. I normally opt for colorful combinations but found my neutral pieces in this outfit surprisingly refreshing. 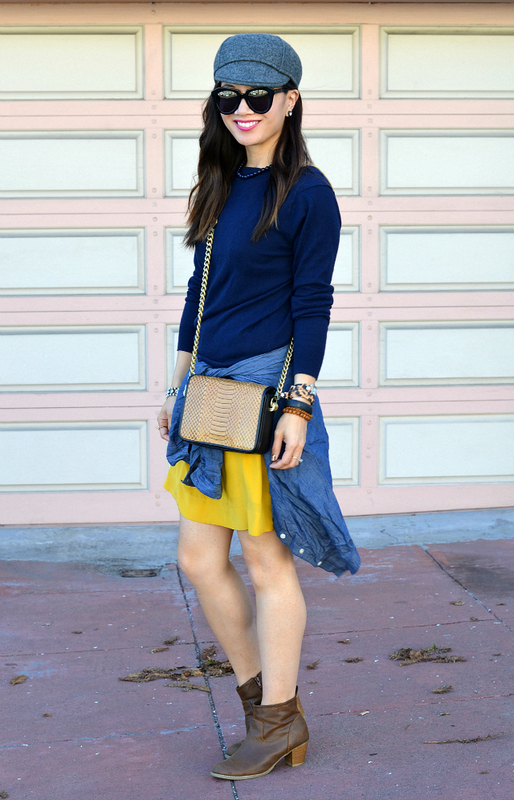 The navy and yellow color pairing remind me of school with the reference to primary colors. Hopefully, I don't look too elementary. What a novel idea for cleaning out your closet! I do love the dress and I also love how you paired it with the hat! I love blue and yellow together. You look so chic in that hat! 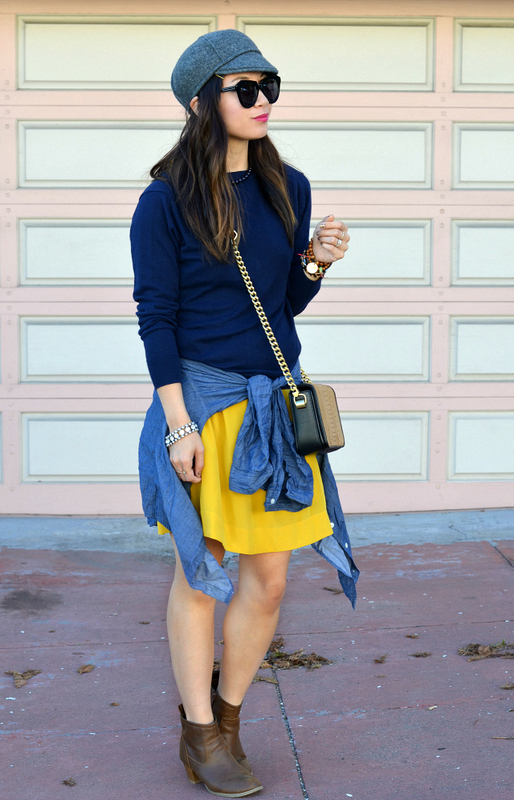 Love this yellow and navy combo! Just noticed your hair is getting so long!!! Great styling, love the mix of colors. Love these colors together and the red lip is the perfect finish. Choosing wardrobe pieces to give away or sell is so tough - for old favorites and things you haven't worn enough of yet! I love this look for fall! I love that you have your shirt tied around your waist! That's so awesomely 90s! 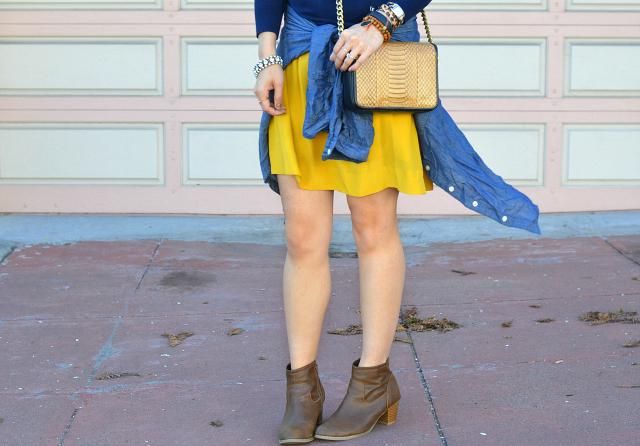 Love the yellow and blue together, so punchy and gorgeous! Love how you've layered in this outfit. You look so ready for fall! Beautiful colors and I love the pink lippy. Nancy, your outfit is so pretty! I love that blue & yellow combination. 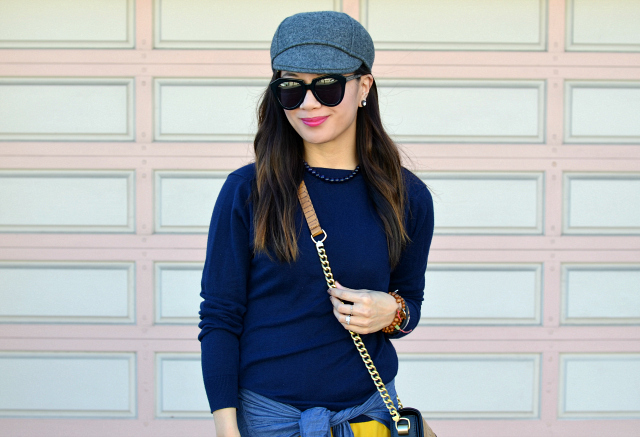 Fabulous cross body bag and swooning over your cap. Total nice look! Beautiful sweater, love how you styled that outfit! Love the bold color blocking!! adorable! love the tie-around-the-waist look. Never elementary Nancy - you are just too stylish! Love those boots - can't believe they are Old Navy. Great look! 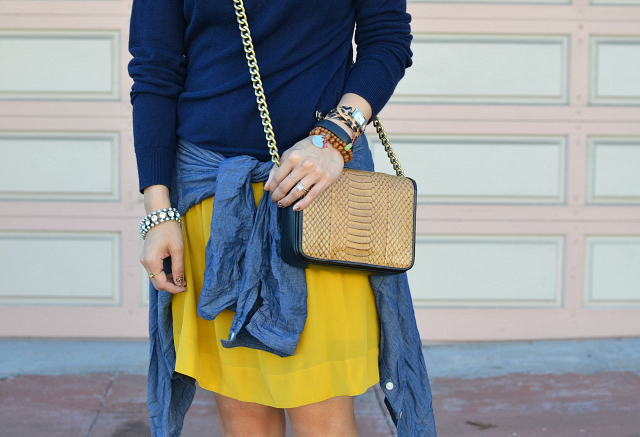 Lovin mix of blue and yellow! Hey Nancy! Great look here and yes, bring on the hats for Fall. blue and yellow, those are my college colors!! :) love this! I think I might be obsessed with your blog. I love hats too, this look and I really love your blog! following now! I hope you would enjoy to do the same!